Verifone. Seucrely accepting all payments including, Apple Pay®, NFC mobile commerce, and EMV™ transactions. Sleek, easy to hand over, simple to use and exceptionally rugged to stand up to the most demanding environments. 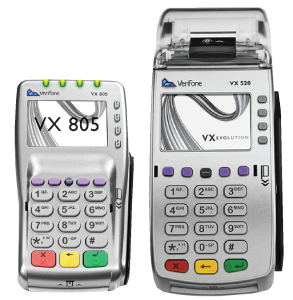 This bundle includes the VX520 terminal and VX 805 PIN pad. Excellent for: any business that is just interested in accepting secure payments and don’t need all the bells and whistles of new technology. The Clover Mini assists many businesses like yours with every aspect of your business. This present day terminal POS system helps streamline your sales procedures, track sales, inventory, and time clock from anywhere with the simple to use applications. Radiant 44 adds on to serve you with all the other support systems including payroll, automatic deposits, taxes and benefits administration together for easy, single source access. Excellent for: Clothing Stores, Bike Shops, Liquor Stores, Vape Shops, Breweries, QSRs, Food Trucks, Auto Services, Dog Grooming & Daycare, Nail Salons, Spas, and more.